Updated on July 15, 2013 to reflect more of the testimony and aftermath of the case. Under Florida's mandatory minimum sentencing requirements Alexander couldn't receive a lesser sentence, even though she has never been in trouble with the law before. Judge Daniel said the law did not allow for extenuating or mitigating circumstances to reduce the sentence below the 20-year minimum. 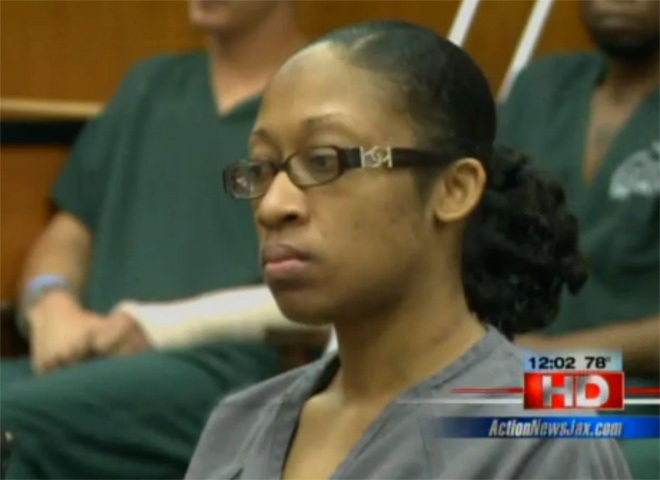 "I really was crying in there," Marissa Alexander's 11-year-old daughter told WETV. "I didn't want to cry in court, but I just really feel hurt. I don't think this should have been happening." Alexander's attorney said she was clearly defending herself and should not have to spend the next two decades behind bars. Alexander's case has drawn support from domestic abuse advocates - and comparison to the case of neighborhood watch volunteer George Zimmerman, who has claimed self-defense in his fatal shooting of Florida teenager Trayvon Martin. According to a sworn deposition taken in November 2010, Marissa Alexander's husband, Rico Gray, 36, said that on August 1, 2010, he and Alexander began fighting after he found text messages to Alexander's first husband on her phone. The two were already estranged - according to her father, Alexander had been living at her mother's since the birth of the couple's daughter nine days earlier, and Gray, a long-haul trucker, said he spent the night before in his tractor-trailer. Gray began calling her names, saying "If I can't have you, nobody going to have you," and blocking her from exiting the bathroom.